Come join us to bind your personal copy the current compendium, the compilation of our newsletter Project Pages from January 2009 through January 2013 (it has been four years since the last one). It is folded into four signatures and consists of 36 book arts and related structures with complete instructions, as well as helpful hints. A very special thank you goes to Peggy Marrs, who designed each project page and wrote the fantastic and understandable illustrated instructions. 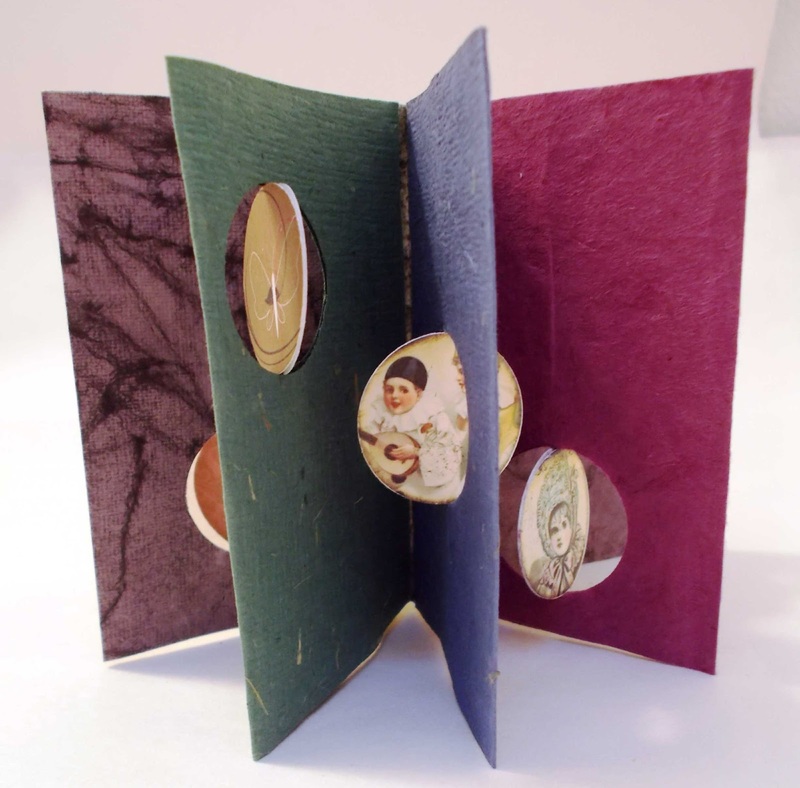 This workshop will teach the single needle Coptic binding, and gives you the opportunity to be as creative as you wish with the covers and the placement of the stitches. You also have the option of bringing your earlier compendiums and bind all four together . One of the advantages of Coptic binding is that it is easily disassembled if you so desire to take apart your earlier volumes. If you do wish to bind all your compendiums together, please make a new set of boards to accommodate the thicker book (your original boards will be a tad too small). All four compendiums will be available, both at this and future meetings. If you wish to have one (or more) mailed to you, please fill out the order form included in the newsletter. Mail the form and a check as instructed on the order sheet. The cost for each compendium is $5.00 plus postage. NOTE: Covers need to be made before the meeting. They should be made at least a day ahead and allowed to dry under weights to avoid warping. 3. Two pieces of end paper 10 ½" x 8 ¼" grain long (same as cover paper or complimentary). Glue the end papers to the backside of each cover. Please make sure the grain of your paper matches the grain of your cover boards, with the grain being parallel to the spine. This will assure that the covers do not warp after binding. 7. Piercing cradle that can accommodate an 11" signature; if you don't have one, bring a phone book which, when opened, can substitute for a cradle. Cost? $5.00 to purchase a compendium. No workshop fee. Lorraine will bring paper, rubber stamps, stamps, etc. to share. Please feel free to bring your own supplies, as well as extras to share with others. FYI...no envelopes are needed...just the cards in whatever size/shape you'd like to make them. If you aren't able to attend the meeting but would like to provide some valentines, please contact Lorraine (see newsletter for details) and she will make arrangements to pick them up by February 11. Our local guild members were treated to two workshops given by one of our favorite book artists—Jill Berry. Ilene hosted these workshops and served a wonderful lunch to all participants. Thanks to Dolores, Sandy, and Ilene for the photos.